For the nth time, I watched Devil Beside You this weekend. 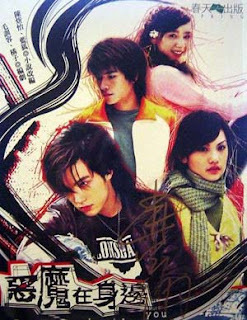 I plan to write a review on it...being one of my favorite taiwanese drama. Not that I need to...since I know it's story by heart. But I miss watching it. And more importantly I miss Mike He (the male lead star)! It was originally shown in 2005. Was adopted from a manga titled Akuma de Sourou. I've also read the manga btw. I have dl the series and also has a DVD copy. Nothing beats watching it in a wide screen in the comfort of your bed while munching this and that. Qi Yue (Rainie Yang) has decided to confess to her long-time crush Yuan Yi (Kingone) but in the process Qi Yue gave the letter to Jiang Meng (Mike He). Jiang Meng bullied Qi Yue and treatened to exposed the letter if she refuse to be his servant. Jiang Meng/ Ahmon/ Prince is the only son of the President of their school. So Qi Yue agreed to it at first but later on got the courage to refuse and directly confess again to Yuan Yi. The later also feels the same way but Qi Yue started liking Ahmon. The thing is Qi Yue's mother and Ahmon's father are dating and already planning to get married. Even if Qi Yue and Ahmon have feelings for each other they did not tell their parents and just go with the flow. They started living in one house as siblings and their relationship got more and more complicated with alot of interventions. Of course they were able to overcome those problems and their parents accepted their relationship. Ahmon is very expressive and has a devil may care attitude. While Qi Yue is very funny and naive - others may comment that her acting is OA but I think the story ask her to be one. I fell in love with Mike He here esp with his smile. From then onwards I searched for all his dramas and watched it all. Haha...talk about being an obsessed fan. wow.. wat a coincident... i miss this drama so much i start to watch it again last nite... really loves mike nad rainie.. there so matching in here..